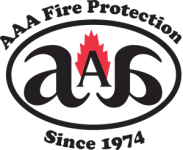 AAA Fire Protection Services is a professional fire protection company that offers outstanding fire extinguisher services. Because we work every day with businesses in Antioch and throughout the East Bay area we see the importance of fire extinguishers in businesses. We also understand why the California Code of Regulations is strict when it comes to compliance for fire extinguishers and fire suppression. Our business has been working with the California Code of Regulations for more than 40 years. We understand what it requires of your business and of all businesses throughout the San Francisco Bay Area. This is why we offer comprehensive fire extinguisher services and fire extinguisher sales. We inspect fire extinguishers annually as dictated by the California Code of Regulations. In addition, we check to see if your fire extinguishers require recharging or hydrostatic testing. They are both required services, but they're not required annually. To help sort that out, we track each fire extinguisher that we service. In doing so, we know when recharging is required and when hydrostatic testing is needed. We go out of our way to make it easy for your business to be in compliance. Our expertise allows us to work efficiently and to provide comprehensive services while still providing affordable rates. If you're ready to work with an industry leader, then just give us a call at (800) 543-5556.